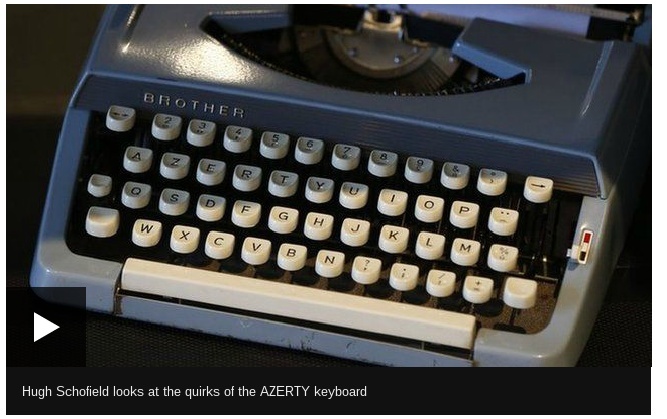 France’s 100 year-old AZERTY keyboard – the equivalent of the English-language QWERTY – is to be reconfigured after the government ruled that it encourages bad writing. The AZERTY set-up has infuriated generations of writers, because of labour-creating peculiarities like the need for two strokes to make full-stops and numerals. But official ire is directed less at such inconveniences, and more at certain quirks and oversights which, it says, make it hard to construct proper French. “Today it is practically impossible to write French correctly using a keyboard that has been bought in France,” the ministry intones. See story here: Is France’s unloved AZERTY keyboard heading for the scrapheap? The problem, I imagine, is that no real science guided the arrangement of letters on a keyboard. Inventors certainly tinkered with the placement of keys, but that was mostly trial and error. In the end, that which sufficed ultimately, well, sufficed. The main problem identified by the culture ministry is the difficulty for French writers to use “certain accented characters – and especially in upper-case”. Some common lower-case accented letters – like é (e-acute) and è (e-grave) – have dedicated keys on AZERTY. The letter ù (u-grave) also has its own key, even though it is used in only one word in the entire French language – où, meaning where. But other accented letters are harder to compose. And accented capital letters require manoeuvres of which, according to the ministry, most people are unaware. Sent from my QWERTY keyboard. Previous post: Is it living, or is it Kulitta?